I went out to L.A. last summer to visit some friends and just had to make a pit-stop at the new mega-Amoeba Records. L.A. was the place to live when I was all hip-hopped out (yes, I seriously was for a little while) and the place where all my favorite hip-hop came from in high school. So, I decided to make it my mission to try to discover some new West Coast underground hip-hop on this specific trip out to the left Coast. While perusing the record bins, I did the natural thing to do and asked the guy working in the hip-hop section at Amoeba to help me out. I left the store with two compilations disks - Grafitti Kings and Fat Jacks' Cat Cater to the DJ. They were out of Beneath the Surface, which the guy assured me was the one I needed to have. I hadn't heard jazzy, melodic hip-hop with fast-rhyming like this in quite some time. I was quickly brought back to the days when peeps like Souls of Mischief, Aceyalone, Tribe and Nice 'n' Smooth were gracing my stereo. Pretty soon thereafter, I received Bus Driver's latest solo effort, Temporary Forever in the mail and was psyched to have a full album of his work. For a guy who is known to kick some freestyle rhymes to the jazz radio station and for someone who used to rap in a jam band. 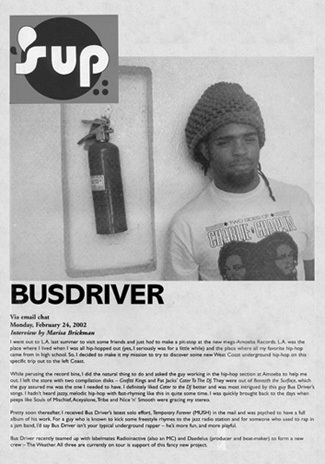 I'd say Busdriver isn't your typical underground rapper - he's more fun, and more playful. Busdriver recently teamed up with labelmates Radioinactive (also an MC) and Daedelus (producer and beat-maker) to form a new crew - The Weather. All these are currently on tour is support of this fancy new project. How long have you been in the rap game? I think around a thousand years. You're always credited with "free association" lyrics - what does that mean - free association? Actually, I don't think free association is an appropriate label for the majority of my lyrics. Implying that I'm just saying unrelated, random abstract stuff. I mean, that has it's place, but my work mostly has a conceptual framework. How do you incorporate politics into your rhymes? Do you have an agenda or a feeling of responsibility to say something meaningful? I like to embellish on conscious rap clichés. Like "Gun Control" is a pretty standard example - it's about the glorification of firearms in rap. I just put my own spin on it. How important do you think it is to have humor in your rhymes? What was your childhood like? Did you always listen to hip-hop? I know you're a huge jazz & bebop fan. Well, I grew up in the hood so I was forced to listen to bootleg MC8 and NWA, but I would secretly listen to live dubs of The Good Life. Who told you I was a jazz fan? I read somewhere that you and your friends would put on the jazz station on the radio and try to rap over jazz songs - that's pretty dope - was that like a challenge with each other or something?? Emceeing is an interdisciplinary, thought-heavy craft. Doing exercises like that is required if you're trying to reach a level of virtuosity... kind of... I guess... well maybe not. I know you lived in Sedona for a little while - I've been there and toured the vortexes & hiked Indian sacred land - it's pretty spiritual (i.e. hippy). Tell me about your experience there and what you got out of it. Yeah, I went to school there and got a handwritten diploma out of it. How do you work with producers? Do they make stuff, give it to you and then you write rhymes? Well when I get new material from a producer to work on, I submit it to my team of ghostwriters - within a week, I have a huge genuine avante hip-hop song. What was the difference in working with O.D. on Temporary Forever and Daedelus on The Weather? Doing songs with Daedelus required a real non-linear approach. All ideas are laid down then prioritized and manipulated. Working with producers on Temporary Forever, like Paris Zax, Daddy Kev, and OD, had a more conventional feel. I don't know what that really means though. How do you feel about collaborating? Do you enjoy it more working with another emcee? I hear you and Radioinactive finish each other's sentences? I prefer to do songs alone, but I colab with Radioinactive 'cause he's so excessively creative. You know, he forced me to say that. Fans? Who would you say yours are? People who will completely read this Q&A. In NYC, a majority of the more underground hip-hop fans are white and in college - is it like that everywhere you go? How do you feel about the majority of the fans of underground hip-hop fans being white - do you even care? My next full-length deals with issues like that, but truthfully, I'm thankful for any fan of this bastardized sub-genre of urban contemporary fluff. How do you feel about white people making hip-hop? White dudes do hip-hop too. For some reason, certain press has treated it like it's a new phenomenon. I think it's because hip white guys are more marketable than hip black ones, but I could just be taking it personally, so don't trust me on it. Your rap style and production is all over the place stylistically - it's very diverse. Do you see that a part of who Busdriver is - constantly changing, or are you still trying to find one specific style/sound to define yourself within? It's not about me, it's about the songs. I just do what I think works for the song. What is the importance of crews in hip-hop? Everybody seems to have one. Wow. I never thought about it that way. I think rap crews are for self-affirmation. It's always helpful to have a bunch of guys reconfirm how dope you are. Tell me a little about your crews, Project Blowed and Afterlife. We're one of the most influential collections of hip-hop artists, but we have absolutely the worst career sense. For example, Mikah-9 should have been D'Angelo and his group Freestyle Fellowship and other Project Blowed emcees like CVE, Medusa, etc defined early '90s LA underground hiphop, but never cashed in on it.